This week, Mayor Miguel Angel Mancera celebrated the Day of the Pedestrian by announcing strong new policies to reduce speed limits and to increase penalties for dangerous driving. In doing so, he ushered in a new era of traffic safety in Mexico City. Mayor Mancera’s actions reflect a growing global recognition of road safety as global health crisis. Around the world, 1.24 million people die in car crashes annually, including 1,100 in Mexico City in 2012—an average of three people killed every day. According to the World Health Organization, road traffic injuries are expected to become the seventh leading cause of death globally by 2030. The tragedy is that each traffic death is preventable. As we saw in New York City over the last decade and in our ongoing work with cities around the world, lives can be saved through strong road safety laws and increased enforcement. Yet nearly 85 percent of nations globally don’t have adequate traffic laws to help counter traffic deaths and injuries. Mexico City joins world class cities like New York and London in addressing the number-one killer on its streets: speeding. 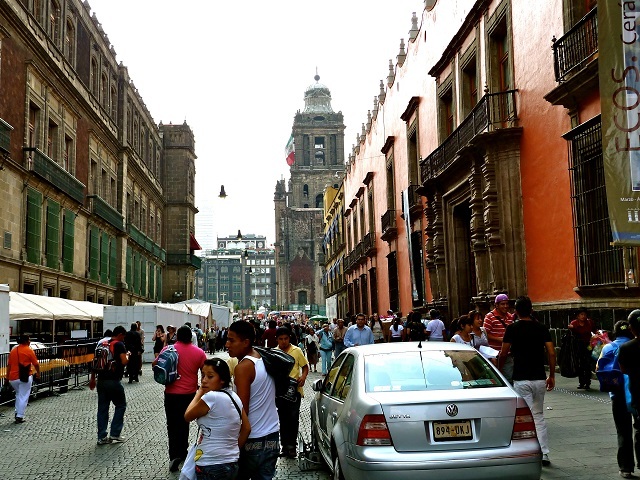 It may seem strange to limit speeding on roads that are frequently clogged with traffic, but statistics show that large streets account for more than 50 percent of the pedestrian fatalities in Mexico City. The difference in 20 km/h in speed can be the difference between life and death, which is why lowering speed limits on primary roads from 70 to 50 km/h will save lives. And even a moment of distraction can take a life, which is why texting or making calls while driving must be treated as a serious threat to the safety of everybody on the street. The mayor’s team began the process of making streets safer by redesigning Avenida Eduardo Molina and Avenida 20 de Noviembre. Safe street designs accompany all new Metrobus lines, including accessible sidewalks, protected bicycle paths and dedicated bus lanes. In addition, dozens of dangerous intersections are being redesigned and new pedestrian crossings are now underway. Mayor Mancera has also taken the bold step of committing Mexico City to Vision Zero—and the principle that no number of traffic fatalities is acceptable. Unfortunately, the fact that you can kill someone with your car doesn’t make people drive safer. Cities must also have adequate penalties and an enforcement system to adequately deter reckless behavior. That’s why Mayor Mancera is bringing Mexico City in line with international norms, and listening to global road safety organizations that call for fines that reflect the danger these kinds of driving pose. New designs, new speed limits, stronger enforcement—these kinds of bold moves have made streets safer in cities around the world. They are part of a whole process of engineering, enforcement and education necessary so that generations learn that traffic deaths are not an inescapable part of daily life.